This is part 2b of the translation of my treatise Jesuspassagerna hos Josefus – en fallstudie into English. 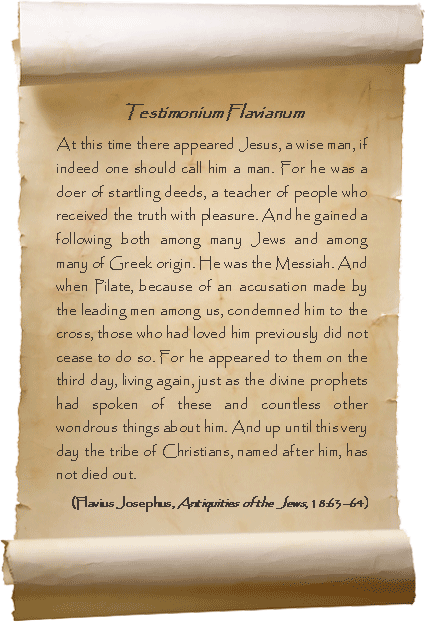 According to the Testimonium Flavianum, Josephus should thus have written that Jesus was “a teacher of people who received the truth with pleasure”. A term such as “the truth” is an identification of the Christian faith as the (only) true religion, something that only a Christian could have written, as you by definition are a Christian if you believe its doctrine to be the true one. Besides, for a Jew it would mean to deny Judaism. Likewise, the unreserved proclamation that Jesus “appeared to them on the third day, living again” is an assertion that reasonably was made by a Christian, certainly not by a Jew while maintaining his Jewish faith. Further it is stated that Jesus was the Messiah, that he was superior to a man, superior to a human being, therefore a god, and that the divine prophets had foretold not only his resurrection, and revelation, but also an additional ten thousand wonderful things concerning him. The one of whom the prophets has prophesized of course was the promised Messiah, and all this aims to identify Jesus as the Messiah. It is not only the expression “he was the Messiah” which identifies Jesus as the Messiah, but also “if indeed one should call him a man” and that his deeds were foretold by “the divine prophets”. All of these opinions are of course quite plausible for a Christian. But would Josephus, a Jew who claims to be a Pharisee, really have appointed Jesus as the Messiah? The answer is for sure no! It is not just that Josephus was a Jew, deeply rooted in the Jewish tradition, and that the Jews also never acknowledged the Christian claim that Jesus was the Messiah; no, Josephus never even shows the slightest sign of being a Christian (apart from what is said in the version of the TF which has survived to this day). All of this can for example be compared to the Roman historian Tacitus, who calls the Christian doctrine “a most mischievous superstition” (exitiabilis superstitio), and Suetonius, who calls it “a new and mischievous superstition” (superstitionis novae ac maleficae). For a Jew to recognize Jesus as the Messiah could be equated with claiming that Jesus was the anointed king of the Jews, inasmuch as this was what Jews put into the concept of Messiah. The Testimonium Flavianum, which is written in Greek, has the expression ho christos (ὁ χριστὸς). At the beginning of our Common Era, the native language of maybe the greater part of all Jews was Greek and not Aramaic/Hebrew, and the Hebrew word ha-mashiah (Messiah) has its exact counterpart in the Greek ho christos. This can be seen in the Septuagint, the authorized Greek translation of the Hebrew Bible, where ha-mashiah consistently is translated into ho christos, which means the same thing, “the anointed”. While those Jews, who still spoke Hebrew, or rather Aramaic, were yearning for the Messiah, the Greek-speaking Jews were yearning for Christos, without there being any other significant differences between them. The word “Christ” is simply the English term for the Greek Χριστός (Christos). While Jews, i.e. those who adhered to Judaism, hardly would agree that Jesus was the Messiah, they would have no trouble understanding what Josephus meant by Jesus being ho Christos. But the large group of non-Jews, whom Josephus perhaps primarily wrote for, would on the other hand not so easily understand the designation. For, unless one was familiar with the Jewish concepts of kings being anointed (christos) to their offices with oil, an expression such as “he was Christos” would seem very strange. What does “he was wetted” mean? The Greek word christos means wetted or anointed. We shall consequently believe that Josephus would have written that Jesus was Christos without having explained the concept. This must be considered as extremely unlikely, on top of the improbability that he would consider it at all. Josephus honours accordingly Jesus as hardly any other. But the thing that is absolutely most striking is the explicit identification of Jesus as the Messiah: “He was the Messiah/Christ!” For this very reason, many scholars want to remove this passage, since it is virtually impossible that Josephus could have written it. But this is not so easily done, since the last sentence, one which among the advocators for genuineness is virtually universally assumed to have been written by Josephus, mentions that “the tribe of Christians, named after him, has not died out.” The fact that Christians are said to have been “named after him” requires that Josephus earlier had said that Jesus was or was called the Christ – otherwise the explanation of the origin of the Christian name becomes inconceivable. Since the expression “he was the Messiah” hardly can be included in a genuine text written by Josephus, but as it also cannot very well be missing, it is often proposed in the reconstructions that Josephus originally had written something more neutral, like “he was thought to be the Messiah.” In support for this, the “reconstructors” rely on a few renderings made in similar wordings by later church fathers. This we will return to. In any case, Christ has to be included as a designation if we are to believe that Josephus wrote the TF, partly because the later statement in the TF that the Christians were named after him [Christ] shall be intelligible, partly because the scanty identification of Jesus as the one called Christ in the later Jesus-passage in Book 20, presupposes that Josephus previously had described who this Christ was. However, every attempt to preserve the identification of Jesus as the Messiah, if only in a down-toned version, leads to problems difficult to solve. Not even then could Josephus reasonably have avoided explaining the meaning of the word. The thing is that Josephus never uses the word Messiah (Christos) besides the two times when Jesus is mentioned, which speaks against him using the word in connection with Jesus. The question is whether Josephus could have used the term Messiah (Christos) at all, even as a neutral term? My own analysis of TF’s authenticity leads to a definite no as an answer to that question. Messiah-figures in Josephus. In his works, Josephus describes no less than 16 men who claimed to be, or could have been perceived as if they were, the Messiah. One of those men is Josephus’ patron, the Emperor Vespasian, whom Josephus honoured. Josephus’ positive assessment of Vespasian is of course coloured by Josephus being in a position of dependence to him, and I have therefore omitted him from the following survey, but I will return to him immediately thereafter. Five of the remaining 15 were probably not considered to be the Messiah, and Josephus had a negative attitude towards three of them, was neutral to one of them and positive to one, namely John the Baptist. Four of the 15 may have been seen as the Messiah, even if this is uncertain. In any case, Josephus had a critical attitude to all four of them. The Emperor Vespasian; according to Josephus the much longed-for Messiah. Josephus accordingly has a very negative attitude towards nine of the ten men who probably or possibly was seen as a Messiah. The 15 alleged men are listed and described in the following footnote. The only ones who Josephus treats with benevolence is Jesus (who he says was the Messiah) and John the Baptist, who himself did not claim to be the Messiah. When Josephus obviously had a bias against anyone who acted as or claimed to be the Messiah, and never even uses the word Messiah – a word that was closely associated with the Jewish rebellion – and as the author of Testimonium Flavianum instead had a positive view of the messianic character of Jesus, and even dares to name him Messiah/Christ, this is a strong indication that Josephus did not identify Jesus as the Messiah in either of the two passages. From this follows 1) that Josephus did not mention Jesus in Book 20 at all, as the only thing said there about Jesus is that he was “called the Messiah/Christ”, and thus is the word used, which Josephus reasonably ought to have shunned or at least have accounted himself for, and 2) that Josephus because of this, neither in book 18 would have named Jesus the Messiah without an explanation; or even would have used the word Messiah. 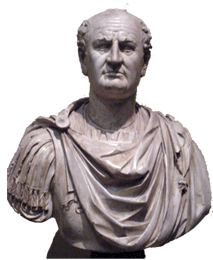 Emperor Vespasian spared Josephus’ life, took him under his protection and offered him a refuge. It was on Vespasian’s commission that Josephus wrote his works, and it was Vespasian who financially secured for Josephus’ future. Of course, this means that Josephus was dependent on Vespasian, and for that reason also described him very favourably. In fact, Josephus designates Vespasian as the Messiah who had come to liberate the Jews; he only avoids using the word Messiah of the Roman emperor. 1) In spite of the fact that Josephus identifies Vespasian as the much longed-for Messiah, he still does not use that designation. Is there any reason to believe then, that he would have used the word Messiah at all to describe Jesus? 2) Josephus had already announced who was the Messiah, then Vespasian. Is there any reason to believe that he would appoint a second Messiah? Alice Whealey, who by many is referred to as a great authority on Josephus, and perhaps is the leading proponent of the thesis that Josephus wrote the entire Testimonium Flavianum including all the praising apart from Jesus being the Messiah, argues sometimes strange. She claims that earlier research anachronistically has assumed that the antagonism which we know arose very early between Jews and Christians also existed in Josephus’ time (the 90’s). According to Whealey, that is not necessarily the case, from which follows that Josephus very well could have written positively about Jesus. Admittedly, we are almost entirely lacking credible information regarding the relationship between Jews and Christians during the first century, but this is in line with the fact that we do not with certainty know anything about Christianity in the early days. However, as soon as we receive such information in the second century, for instance in Celsus (whose work from 178 CE is summarized by Origen) – the Jews are contemptuous and often fierce towards Christians and Christian doctrines. The strange thing about Whealey’s argument is that the way she presents it, it is no argument. That is because she does not substantiate it, only leaves it at an unsupported assertion. It is on the same level as if you said that you must be careful not to assume that the ancient Christians were telling the truth about Jesus. That is not a valid argument either! A perhaps ever stranger argument by Whealey concerns the Greek word poiêtês (ποιητής) in the Testimonium Flavianum, which there means “to perform something”. Josephus never uses the word in this sense while Eusebius often uses the term with exactly this meaning and, moreover, solely when he writes about Jesus or God. Reasonably this should indicate that Josephus did not write this sentence and that Eusebius seems like a likely candidate to have written it. Instead Whealey argues that Eusebius read the Testimonium Flavianum, was influenced by Josephus’ single usage of this particular word, and as a consequence, embraced the term himself, but then only when he writes about Jesus. That explanation seems fabricated in order to achieve what one seeks, to say the least. Josephus was not a Christian. It is really impossible to refer to any passage in Josephus which supports that Josephus was not a Christian, since the symptom of this is that he did not express any Christian beliefs, or even mentions them. The only thing that can be said about Josephus is that he does not confess to the Christian faith (except of course in TF, but since that particular passage is examined it cannot be referred to), that he never expressed specifically Christian values, and that every time he had the opportunity to comment upon people acting as if they were Messiah (without Josephus ever using the word Messiah) he just expresses contempt for them. This is the reality. That you cannot a priori assume that Josephus was hostile toward Jesus is more of an apologetic defence than an honest argumentation based on facts, which say that Josephus was not a Christian and otherwise hostile to all God-inspired freedom figures. To sum up; nothing (other than TF) indicates that Josephus was a Christian, why he hardly could have written the Christian passages, and least of all that Jesus was the Messiah. Otherwise he only expressed contempt for any self-proclaimed Messiah-figure. He otherwise never uses the term Messiah (of course on condition that he did not write the Jesus passages), not even of the Emperor Vespasian, whom he yet indirectly appoints Messiah, why yet another Messiah in the form of Jesus is nothing to think about, not even as one who was considered to be the Messiah, inasmuch as Josephus reasonably must have explained himself. First of all, he should have dealt with the Jewish concept of the Messiah; secondly he should have explained to the non-Jews what he meant by Jesus being “wetted”; and thirdly have explained himself on the fact that he indirectly already had appointed the Emperor Vespasian as the Messiah. The word Messiah or Christos/Christus is a proper word in Hebrew, Greek/Latin, meaning “the anointed”. In ancient times it was used to describe the Israelite kings, prophets and priests who were anointed to their offices by the holy oil of YHVH. When it comes to Christianity, however, the Jesus character obtained the epithet of Messiah/Christ as a proper name. “First, the word ‘Christ’ (Greek christos) would have special meaning only for a Jewish audience. In Greek it means simply ‘wetted’ or ‘anointed.’ Within the Jewish world, this was an extremely significant term because anointing was the means by which the kings and high priests of Israel had been installed. The pouring of oil over their heads represented their assumption of God-given authority (Exod 29:9; 1 Sam 10:1). The same Hebrew word for ‘anointed’ was mashiach, which we know usually as the noun Messiah, ‘the anointed [one].’ Although used in the OT of reigning kings and high priests, many Jews of Jesus’ day looked forward to an end-time prophet, priest, king, or someone else who would be duly anointed. Judas, son of Hezekiah (Jewish War 2:56, Antiquities of the Jews 17:271–272), Simon of Peraea (Jewish War 2:57–59, Antiquities of the Jews 17:273–277), John the baptist (Antiquities of the Jews 18:109–116), Herod Agrippa (Antiquities of the Jews 19:338–353) and John of Gischala (Jewish War, the books 2–6, 7:264). Athronges, the shepherd (Jewish War 2:60–65, Antiquities of the Jews 17:278–284), the Samaritan prophet (Antiquities of the Jews 18:85–87), Simon bar Giora (Jewish War 7:26–32) and Jonathan, the weaver (Jewish War 7:437–450). Judas, the Galilean (Jewish War 2:433, Antiquities of the Jews 18:1–10 & 18:23), Theudas (Antiquities of the Jews 20:97–98), the Egyptian prophet (Jewish War 2:261–262, Antiquities of the Jews 20:169–171), an anonymous prophet (Antiquities of the Jews 20:188), Menahem (Jewish War 2:433–450). 1. The first person is Judas, son of Hezekiah. When Herod the Great died in 4 BCE, Judas appeared as a leader of a band of robbers who revolted against the “rule of his son and successor, Herod Archelaus”. We do not know what happened to Judas, but Josephus describes him as terrible to all men and extravagance in doing injuries. He was driven by ambitious desire of the royal dignity and tried to raise himself. Josephus despised this Judas, but although Judas made royal claims there is no evidence that the claims were messianic. (Jewish War 2:56 and Antiquities of the Jews 17:271–272). 2. Then we have Simon of Peraea, who also was a leader of a group and he claimed the kingship for himself after Herod died in 4 BCE. Simon was initially a slave of King Herod. Later on he put a diadem on his head, which only were meant for the High priests, and “was declared to be a king, and he thought himself more worthy of that dignity than any one else.” Simon certainly appears as a Messiah, but Josephus never says that he was considered to be the Messiah. He was captured and beheaded. Josephus describes him as tall, handsome and strong and superior to others, but considers him arrogant when he proclaimed himself to be a king. Josephus’ description of him is pretty neutral, given that Simon burned and looted the palace (Jewish War 2:57–59, Antiquities of the Jews 17:273­–277). 3. Next in line is Athronges, the shepherd, who also participated in the revolts following upon the death of Herod the Great. Also this man was so insolent that he was crowned with a diadem. We do not know what happened to Athronges, but Josephus says that he and his men did their own nation a great deal of mischief. Being a shepherd, like for instance David, might have given him a position to aspire to a messianic kingdom. But as Josephus never says that Athronges was anointed (Josephus never uses the word Messiah) we cannot say for certain that he had messianic claims (Jewish War 2:60–65, Antiquities of the Jews 17:278–284). 4. Then we have Judas the Galilean, who together with the Pharisee Zadok started a revolt against the introduction of new taxes; a movement which eventually led to Quirinius interfering and conducting a census in the year 6 CE. This is the same event which Luke connects to the birth of Jesus. Judas was zealous for the Law and he likely gave rise to the zealot movement. Judas had an inviolable attachment to liberty and Josephus considered him arrogant. Josephus actually hated Judas and said that all sorts of misfortunes sprang from Judas and his men. (Jewish War 2:433, Antiquities of the Jews 18:1–10 and 18:23) This Judas was a great leader and it is very likely that he was seen as a Messiah, especially since his grandson Menahem was. The same Judas is also mentioned in Acts 5:36–37. Josephus further tells us that two of Judah’s sons, Jacob and Simon, were crucified in the 40’s (Antiquities of the Jews 20:100–103). 5. Next we come to John the Baptist. According to the chronology of Josephus, John was executed sometime 35–36 CE, and thus long after Jesus was executed, if we are to believe the Gospel story. Both the Gospels and Josephus make it clear that John did not consider himself to be a Messiah. Josephus has quite a positive attitude towards John, and he says that John was a “good man, who had commanded the Jews to exercise virtue, righteousness towards one another and piety towards God.” (Antiquities of the Jews 18:109-116). 6. Josephus also tells about a Samaritan prophet whom he does not name. The time is circa 36 CE. This Prophet attracts a large crowd of people to the holy Mount Gerizim. Pilate, knowing that this was a way to claim the Samaritan temple, attacked the group and killed many. This action was something Josephus did not seem to mind. (Antiquities of the Jews 18:85–87). To announce the restoration of the cult in the Samarian temple is of course a kind of messianic claim. But the Samaritans, although having almost the same religion, were technically not Jews. 7. Josephus also describes how Herod Agrippa in the year 44 CE put on a garment made wholly of silver, and of a truly wonderful contexture, and when the silver of his garment was illuminated by the rays of the sun, it shone out and was resplendent. The people flattered Agrippa and called him a god, superior to the mortals. Agrippa did neither rebuke them, nor reject their flattery. But he then realizes that this was unwise, and that he as a result thereof would be punished. He suffers from stomach pains and eventually dies of his illness (Antiquities of the Jews 19:338–353). In Acts 12:19–23 the same story is told and it is said that Agrippa was eaten by worms. Josephus was not so fond of Agrippa, and although Agrippa by some was seen as a divine being, it is uncertain whether he really was thought of as the Messiah. 8. Theudas, who also is mentioned in Acts 5:36, was certainly a Messiah figure, and there can be no doubt that he saw himself as the Messiah. This can be shown as he like Moses and in order to show people his power tried to divide the river Jordan – a typical act of messianic pride and a clear allusion to Joshua 3:14–17. He drew large crowds and Josephus considered him to be a charlatan and an impostor. Theudas was captured and beheaded and his head was brought to Jerusalem. (Antiquities of the Jews 20:97–98) Since Josephus calls him a charlatan and gives no hint that he disliked the act of beheading Theudas, one can certainly say that Josephus did not like Theudas (the Messiah). 12. John of Gischala was a commander of the Jewish armies in Galilee during the revolt 66–70 CE. He gained control of most of Jerusalem and appointed his own high priest. He certainly behaved like a king and Josephus considered him a tyrant or despot who showed impiety towards God. But he was hardly considered to be a Messiah, as his coins bore the symbol “Freedom of Zion”, which “was a political and not religious marker”. 13. Next we turn to the Emperor Vespasian whom Josephus believes has fulfilled the messianic star prophecy of Balaam: “The oracle of Balaam son of Beor … A star will come out of Jacob; a scepter will rise out of Israel.” (Numbers 24:15, 17) Josephus suggests that the Jews now finally have got their real leader (Jewish War 3:399–404 and 6:310–315). But one should remember that when Josephus wrote this in the year 78 CE, Vespasian was his patron and the one who funded his project, so I consider this reference to be of less importance. 15. Finally, we have Jonathan, the weaver, who was a Sicarii. In circa 73 CE, he led a group of people “into the desert, upon promising them that he would show them signs and apparitions.” Also this group was attacked by the Romans and Jonathan captured and burned to death. Josephus calls him a vile person (Jewish War 7:437–450). Jonathan definitely was a prophet like Moses, even if we cannot know for sure if he proclaimed himself Messiah. The information is mainly from Jonah Lendering, Messiah (overview) but independently arranged. Why didn’t you mention here that Origen states that Josephus was not a Christian? Surely, if Origen’s copy of the Antiquities contained ”He was the Christ,” or any of the other Christian lines in the Testimonium, he wouldn’t have written that. I am sorry, but I can’t recall having read in Origen that he states that Josephus was not a Christian, only that he did not accept or believe in Jesus as Christ (Origen’s knowledge; On Matthew and Against Celsus). Have I missed something?